There will always be a fringe, living in its own private madhouse, that will never accept truth regardless of how it is presented. As night follows day, the link is followed by a blockquote selection from the inspiration. Here, you have several options. You can just end it with some quick snark, or go on an extended rant. Notice that I’ve blockquoted that, in a large boldface font, so it actually looks like a headline. It helps if you include a photo of Jimmy Carter with a sarcastic caption. His goal is to bring back Aijalon Mahli Gomes, a 30-year-old man from Boston who was sentenced to 8 years in prison in April, about three months after he was arrested crossing into North Korea via China. Sen. John Kerry, D-MA, had offered to go to pick up Gomes and has been working on the case for months. Yeah, it figures: This guy from Boston must be a Democratic voter, and Kerry wants to get him out of North Korea and back home before Nov. 2, so the guy can vote for Barney Frank. This shows Democrats must really be freaking out over the mid-term election, and are afraid that Republican challenger Sean Bielat is gaining momentum. Let’s make a deal: If this Boston guy gets to come home, the North Koreans keep Jimmy Carter. And that is how you do an awesome blog post. Please visit Jerry Wilson’s “Goldfish and Clowns” blog. He’s into NASCAR and Christine O’Donnell. Now if only you can fisk a Jimmy Buffett song and use it to describe Obama’s multiple vacations, you’ll hit Triple 7’s. Let’s be generous here: the Norks keep Jimmy Carter AND Senator Lurch. “And that is how you do an awesome blog post” in wingnuttia. Virginia Right! News Hound for 8/24/2010 | Virginia Right! 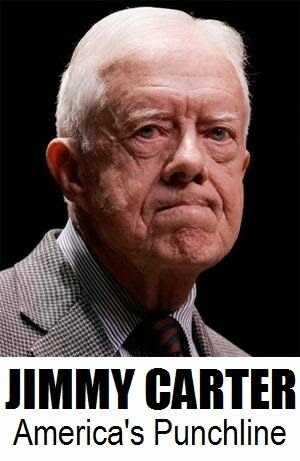 I always take heart when I hear Jimmy Carter is flying into someplace to bring peace. Planes sometimes crash. I actually saw the guy in my little rural poor county, at a Habitat for Humanity groundbreaking/presser. Jimmah and Rose rolled in in a limo, with security detail attached, he gets out and puts on a helmet and tool belt and poses for a few “hammering in the nail” photos, then they are all off in a flash – the whole charade took no more than 15 minutes start to finish, Carter said nothing to the assembled crowd (he did wave “hi” and “bye”) and very little to the workers there. Carter did have a couple of good ideas coming into office, Zero Base Budgeting and taxing all income only once (ending the tax on dividends), but they were dependent upon the financial knowledge of Bert Lance, who was derailed by a phony scandal, and went nowhere in Washington. Other than those things he was never able to achieve, his only high point was in swallowing the poison and appointing Volcker with independent authority to stop inflation. When I hear of a lone American sneaking into North Korea and getting caught. My first thought is the guy is most likely CIA trying to get into the country to get intell. Naturally the government wants to get him back as soon as possible so that the next guy they send on missions has the courage to sneak into the next hell hole country knowing his government will try very hard to win his release. That Charlie Booker video must have made an impact. Mass. DemocRats going the extra mile in their quest for votes, meanwhile, back at the asylum, DemocRat run states foot drag on sending out election ballots to members of our military. http://electionlawcenter.com/ has this covered extensively.